Upon completion of this programme you are entitled to the degree Bachelor of Science. You will be an expert in linking logistics processes, flows of goods and communication. You can start your career, for example as a logistics analyst, planner, ICT consultant, purchase manager, supply chain manager or project manager. 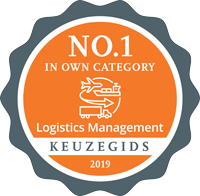 Transport companies, production companies, multinationals and many other organisations are always on the lookout for logistics talents. In the first year you will learn what logistics means for various sorts of companies, what differences there are between companies and how you can survey all the logistics processes in a company or organisation. So you will become acquainted with subjects such as supply and purchasing management, law and transport management. For this purpose you will follow lectures, seminars, training sessions or guest lectures which are often linked to a group assignment. In the first year excursion week you will see how logistics is applied in all sorts of companies; you will see the theory from the preceding weeks in actual practice – an eye opener! Because logistics is an international specialisation, considerable attention is paid to logistics in an international context. If you would like more information about the three-year track, contact the student counsellors from this study programme, Minke Snels and Lizanne Hessels: decaanslm@buas.nl, telephone (076) 533 26 44 or (076) 533 26 39. You can also download the prospectus Mbo-hbo doorstroomtraject (information is in Dutch).